Something is wrong with me. I am missing some vital ingredient that other people have. I am set apart, different. I do not quite fit in anywhere. Fortunately, the Fatal Flaw is not as bad as it sounds, because it’s not a real flaw. Instead, it’s something far more powerful than a flaw. It’s a feeling. Legions of people walk this earth held back by something which they cannot understand, and for which they have no words. It’s a feeling with the power to hold brilliant men back from achieving their full potential and powerful women back from becoming presidents of companies. It’s a feeling that will not break you, but it will dog you. It will keep you standing alone at the PTA meeting, or sitting pretending to work while others chat freely at a conference. Unaddressed, it can set you apart so that you feel alone, and gradually wear away your connection to the world. The Fatal Flaw is a product of the invisible, subtle powerful force, Childhood Emotional Neglect (CEN): A parent’s failure to respond enough to a child’s emotional needs. 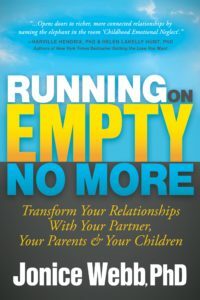 Children who grow up in households where their feelings are ignored or discouraged push their emotions down and away, to adapt. As adults, they lack access to their own feelings, which are a vital source of richness and connection in life. Deep down, they sense something missing in them that other people have (it’s their emotions). These two results combine to form this un-nameable sense of being different, of not fitting in, of being alone and out of place; a perfect breeding ground for social anxiety. Because its source is so invisible, many people who grew up with CEN are completely unaware, and so many with the Fatal Flaw are completely unaware. It is, in fact, your lack of awareness that gives the Fatal Flaw so much power over you. Barbara and Donald just walked into the Johnsons’ anniversary party. They only know a few people there. Donald stands uncomfortably next to Barbara while she introduces herself to some guests. He fights the urge to excuse himself and flee the room. “I feel that I don’t fit in here, but I know that it’s not true,” he thinks to himself. “It’s not real, it’s just a feeling. It’s my Fatal Flaw.” Donald takes a deep breath and puts out his hand because he knows that as soon he puts warmth out there, it will flow back to him. And his Fatal Flaw will be neutralized for the remainder of this party. If you have the Fatal Flaw, there are four things that you can do that will quickly and effectively put you in control of your social discomfort. Recognize that your social anxiety is not based upon reality, but only on a feeling. You feel you don’t belong, but it is not actually true. Don’t give the feeling so much power. Start trying to get in touch with your emotions, in general. This will begin to break through your CEN barrier and help you tap into the rich source of connection and belongingness that other people enjoy. Tell someone close to you about your Fatal Flaw, so that they can help you by reminding and supporting you in social situations. Prepare yourself before every social occasion. Close your eyes, and walk yourself through it in your mind. Imagine yourself at the gathering, behaving warmly and confidently. Remind yourself that you are worthy and that you matter. I feel that I don’t fit in here, but I know that it’s not true. It’s not real, it’s only a feeling. It’s just my Fatal Flaw. 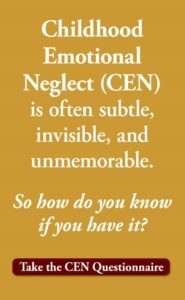 To learn more about the Fatal Flaw, CEN, and how to overcome it, see Take The Emotional Neglect Test. It’s free. 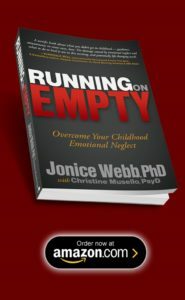 Or see the book, Running on Empty: Overcome Your Childhood Emotional Neglect. I have found that once I get to the event I am able to overcome my anxiety. I do enjoy groups of people now, however when it is over I cannot get certain conversations out of my head where I perceive that I may have said something that was not well received. This happened 9 months ago and I am still burdened by this thought. Wish I would have known this sooner! I’d like to add that social anxiety can also create a self-affirming downward spiral. I’m anxious–> I behave anxiously–> others can tell–> they act anxious around me–> I read this as disapproval–> I shrink up, record it as a negative experience, and set myself up for an even more anxious future. This goes on until I just don’t go anywhere anymore — and has affected my jobs, marriage, children, ability to have fun… Thanks Jonice for the article. Love your book, too. Yes Candy, that’s a perfect description of the anxiety spiral that I’ve seen many caught in. Thanks for your comment! I get this feeling very strongly and remind myself it is only a feeling based on a flawed perception. We want to trust our feelings, but truthfully, feelings can be very misleading. Just look at anyone with an extreme phobia! Their problem is completely in their own head. I flood myself with a strong imaging of how it feels to be included, to fit in, to securely know what is going on and magically, I am experiencing it more and more. When I don’t, I take a moment to recapture that security and continue. It’s exciting to overcome something that has been an obstacle for too long. Thanks so much for sharing your experience Janet. That’s exactly how healing happens! Keep up the good work. All of this is pertinent and accurate but it too, is out of reach. The awareness of my shortcomings panics me and none of your methods can be used. Remedies are buried in fear…. I understand. Do not give up. Just keep trying!